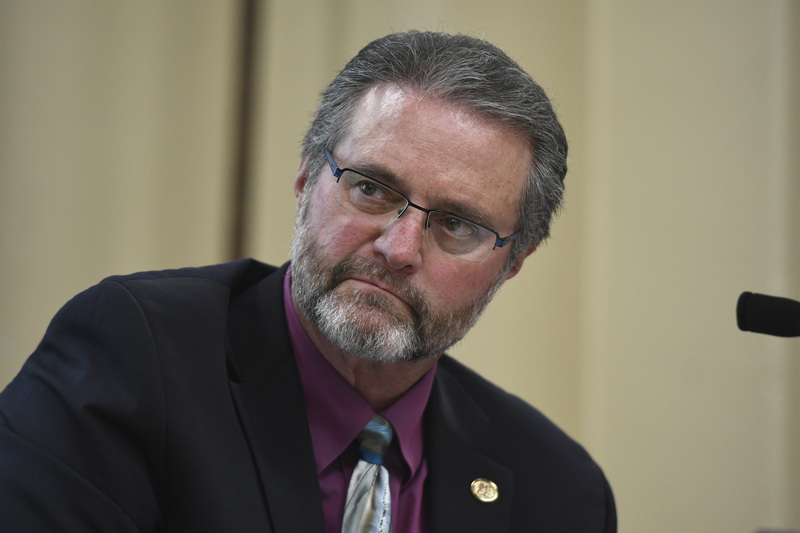 Santa Barbara City College Superintendent Anthony Beebe’s last Board of Trustees meeting on March 14 was mostly business as usual with heated debates and intense disagreement. But before jumping into discussion, boardmembers each took a turn thanking Beebe for his service and highlighting some of his many accomplishments during his three years at the college. Beebe had announced his unexpected retirement for health reasons on February 8. The board presented Beebe with a plaque and posed for a picture with him before moving into discussion about an anti-racism resolution and the five-year fiscal projection for the college. Both items will return to the board when Interim Superintendent Helen Benjamin takes over the position. Benjamin will start at SBCC on April 1 and will attend her first board meeting April 11. She was chancellor of the Contra Costa Community College District for 11 years, before retiring in 2016, and she has also served as president of the California Community Colleges CEOs, president of the board of the Community College League of California, and chair of the California Promise Leadership Team. Benjamin will be with the college until December 30, 2019, when a permanent superintendent will take over the position. Discussion about the anti-racism resolution ended with Trustee Jonathan Abboud pointing to trustees Veronica Gallardo, Marsha Croninger, and Craig Nielsen, accusing them of perpetuating racism. “If someone wants to know what racism looks like in politics and in an elected official, you can look to my side,” said Abboud, gesturing at the three. Gallardo, Croninger, and Nielsen oppose the anti-racism resolution as it’s currently written. “Attacks on something so simple, that we don’t need something like this,” said Abboud. The resolution draft acknowledges that racism exists and that an equity gap persists at the college. It pledges to direct the superintendent to work collaboratively with campus stakeholders and employees to develop an anti-racism plan. Croninger said she felt the board had no evidence for a number of the statements in the resolution and that she was “deeply uncomfortable with the resolution as written.” She called the proposed resolution “pretty negative” and presented a more “positive” resolution draft that will be up for discussion at the March 28 meeting. The two drafts will return to the board once Interim Superintendent Benjamin is on the board. In the five-year fiscal projection report, the trustees heard SBCC is expected to have deficits of $1.8 million this year and $3.6 million the following year. In 2020-21 the deficit begins to decrease, and a $500,000 surplus is expected for 2022-23. The largest contributor to the deficit is a decrease in enrollment, which fell unexpectedly by 2 percent this year. In the upcoming year, a one percent decrease is expected as the college works to restore enrollment. The funding formula for community colleges also changed this year from being dependent only on enrollment to a combination of factors, including student enrollment, the number of low-income students enrolled, and student success. The college received an additional $9.1 million in part because of student success. The board will hear an updated revenue projection at the June 20 meeting.